I began at 155 and ended at 132. I went from a size 12 to a size 6-8. I have more energy now, feel better, and feel I have control in my life! Clothes look better, too. At first my friends didn’t notice- many thought I wasn’t “fat”, but with the new clothes and new habits, they remarked “What are you doing? Are you alright?” The immediate assumption you are ill because you’ve lost weight! This was a plan I could follow- really stick to, and no cravings! Sometimes I didn’t want everything I could eat! At times I felt a bit dizzy but I’d have a protein drink and be fine. I had some leg cramps, but the salt pills took care of that. I struggled with time to exercise- it is hard to find time when you work full time. I started doing it a home with light weights and the fitness ball and treadmill. My husband was on the diet for 6 weeks before I began, so he helped me learn how and when to eat. Mary Ellen is a super nutritionist. She is friendly, always up and encouraging and really cheerleads you right through this. I did not think my lower belly would go, but it is going and I feel great about that. In your late 50’s you kind of assume you will have it just through the aging process- but this program really helps that and it is much smaller now! Try to eat about every 3 hours and don’t skip your protein-feeds! Take potassium as recommended and take sodium if you get leg cramps! 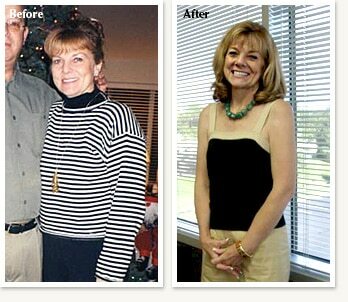 Be honest with your nutritionist- Mary Ellen was great in getting me motivated or unstuck! I really plan to eat right and keep this weight off- it is a great plan!